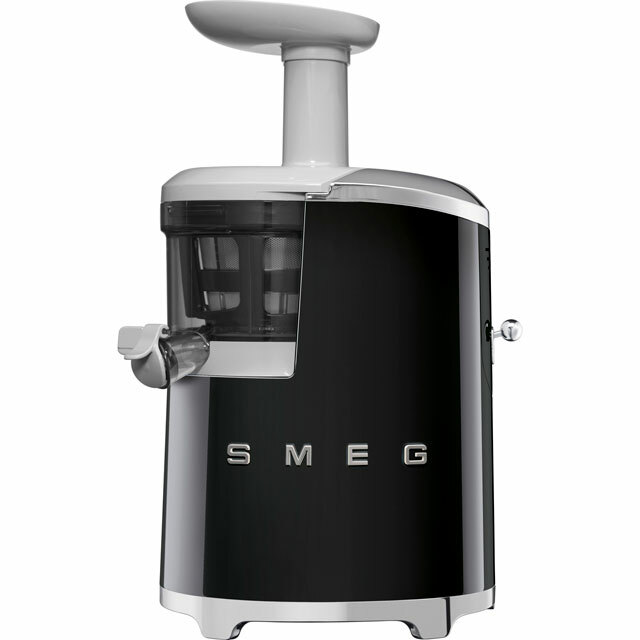 Effortlessly prepare nutritious drinks with this black juicer from Smeg. Its generous 5 litre capacity is ideal for creating super healthy juices. The clever Slow Squeezing system slowly juices your ingredients to retain as much flavour and as many nutrients as possible. It has a bladeless rotating brush design too, which gives you super-smooth results at the touch of a button. Thanks to the anti-slip feet, your juicer will sit safely and securely on your counter when it’s being used. It’s dishwasher safe as well, which makes it really easy to clean. Great item, easy to use. Works perfect, the best natural juice. Great printer, easy to use, best quality. I love the retro styling of this SMEG Slow Juicer- it's an aesthetic addition to any kitchen. It comes in other colours too. Most importantly though, it's great quality- very heavy and sturdy. It comes with a useful instruction manual with colour photographs so is very easy to set up, to use and to clean afterwards (the washables are dishwasher safe too). The manual also contains lots of juicing recipes so you can start using it straight away. It's a quiet machine. It makes 500ml of juice at a time. It is expensive but if you want to make juices in the long term it's a great investment.